The Nuclear Green Revolution: The word "efficiency" really means "scarcity"
The word "efficiency" really means "scarcity"
"verdict on the structure’s function as a office space for federal employees is nearly unanimous: it is a disaster." I apparently lack sufficient understanding of green technology, as it does not seem that a bike rack would “get you to the same point” in terms of keeping workers cool. In the real world on the 15th floor of the Federal Building, workers seek to relieve the heat by opening windows, which not only sends papers flying, but, depending on their proximity to the opening, makes creating a stable temperature for all workers near impossible. When I spoke with a Labor Department worker at the building (who noted that she is encountering the type of bad work conditions that her agency is supposed to enforce against), she confirmed what might have been an urban legend: that some employees must use umbrellas to keep the sun out of their cubicles. The lack of internal climate controls has left some workers too cold and others too hot. A happy medium has proved elusive. And while the managers’ offices do have heat and air conditioning -- a two-tiered approach fitting in a building named for Bush -- the “green” design apparently has messed with the effectiveness of these systems, leaving these top staff as physically uncomfortable as the line workers. Green does not have to mean that energy efficiency is taken beyond human comfort, however. Some good energy efficiency technologies are consistent with both. Heat pumps are moree efficient than direct heating, and although not as efficient ground soce heat pumps, air source heat pumps are more practical for homes in many areas. Solar hot water heaters are efficiency aids in many areas and solar heating works some places. Beyond that building efficiency has to rely on local wisdom, and good energy management. I believe that more attention needs to be paid to energy efficient computers. Energy consumed by computers is often paid for twice, The first time wnen the electricity used by the computer is paid for. The second time is when the cost of cooling the heat from computers is added to the electrical costs. It is certainly possible to cut down on computer related electrical use, for example by adopting electrical efficient laptop computer technology in desk top computers. Thus while improved energy efficiencies are possible, building energy efficiency cannot be counted on to displace significant power demand. Thus the inclusion of significant energy savings in future energy plans is at the very least premature. What energy planners mean when they argue for energy efficiency is for future energy supply cuts. The problem for renewables energy planners is simple, it is impossible that renewable technology would be able to supply all of the energy required by the national economy at present rates of energy consumption. "Efficiency" is the word used to cover the fact that no energy source is available to cover all future energy needs. 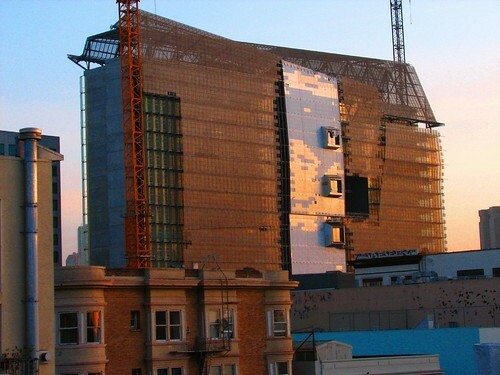 The San Francisco Federal office Building is an experiment by the government, to see how welll workers can tolderate a no air conditioning energy environment. The answer is not well. Thus politicians contemplating a post-carbon, post-nuclear energy future will have to contemplate how they plan to deal with worker dissatisfaction with their working conditions. So far politicians like Al Gore have listened to Amory Lovins. They have bought into the belief that future energy scarcity can be papered over by the word efficiency. Ya, sure. The real shame is that while these so-called efficiency experts are promoting their scarcity agenda, the world is, in reality, awash in clean energy available from nuclear sources. It is the irrational fears, lack of imagination, and ulterior motives of these "experts" that keep society from rapidly progressing towards using the abundance that surrounds us. Well-said...the word 'energy crisis' hopefully will have no meaning in our vision of a not-too-distant nuclear future. it unfortunate that this example is unsuccessful. Andrew, for a variety of reasons most people prefer to not live in caves. Increasing energy efficiency is a given. But it doesn't substitute for increasing clean energy production. The problem with people who believe that our energy problems can be solved by efficiency alone is the fact that they don't account for the fact of-- ever increasing-- energy demand due to economic growth and population growth. What do you think of the "petrodollar" conspiracy theory, that asserts that since the end of Bretton-Woods the US$ has effectively been backed by oil, and that it is therefore in the US interest to delay the world's move away from oil for as long as possible? It is true that the dollar is the international currency for oil purchases. The role of the dollar in international trade is unsustainable, and in some respects highly unfavorable to American based manufacturers. Current international economic problems are partly due to the fact that the current economic system made manufacture too expensive in the United States.